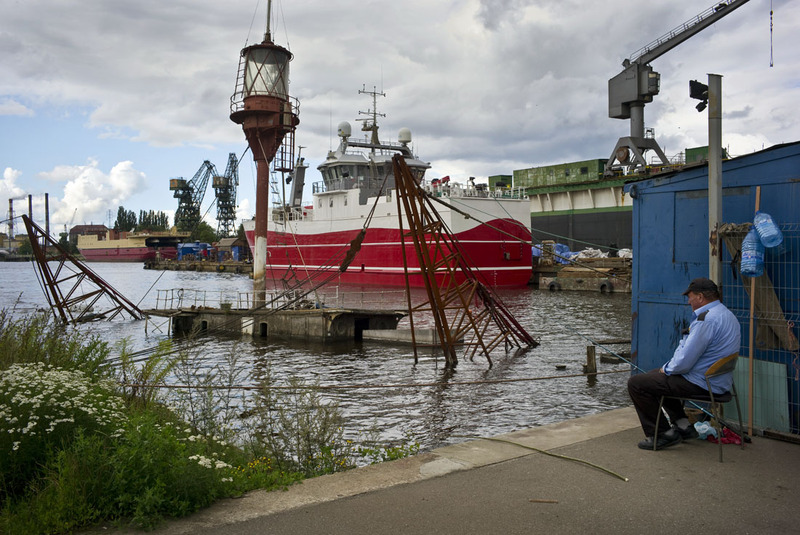 With two rods in the water, a Gdansk Shipyard worker settles in for a quiet Sunday afternoon. Rewind approximately 40 years, the Lenin Shipyards as they were known, was the birth place of Solidarnosc (Solidarity), the Polish non-governmental trade union co founded and led by the dockyard electrician, Lech Walesa. Solidarity was the beginning of the end for the Soviet Union and Lech Walesa went on to become the President of Poland (1990-1995) picking up a Nobel Peace price along the way. Obviously, this is the nutshell version. Later that afternoon we came across a small gallery in the Gdansk old town area where I met Polish photographer, Maciej Kosycarz, who represents his deceased father’s (also a photographer) print and book sales of Cold War era Poland. The shipyard and Solidarity came up in the conversation along with Polish current affairs. As with the rest of the world, I got the feeling Poland has issues as he invited us to a pro democracy rally in Gdansk later that evening. At a similar rally two weeks earlier, he said the man himself, Lech Walesa, made an appearance and there was a strong possibility he would again that evening. A pro democracy rally and a chance to possibly meet the man who spearheaded the demise of communism, Gdansk that Sunday evening was the place to be. We arrived later at the designated location to a crowd the size of an average wedding. Holding candles and singing the national anthem against a backdrop of trams and old buildings, it was enormously enchanting, I had to remind myself this was a political rally and not carols by candlelight. Bicycle lane monitors were in place for people like me who continually forgot about the bike lanes in the Baltics, near misses with speeding cyclists became the daily workout routine. In comparison to the often violent anti Apartheid rallies I cut my teeth on in the 80’s with the press, this was a pleasant evening out on the town. Word got out that we were from South Africa which shot us to instant celebrity status, we were forgiven for not knowing the words to the Polish national anthem. Lech Walesa didn’t make it that evening but another well known and respected ex-cabinet member, Bogdan Borusewicz, did. I watched a self-conscious lady jostle her way into position to have her picture taken in front of him. I felt a little embarrassed for her as he stepped up and had his picture taken alongside us once Maciej told him who we were. A few more songs, some light banter with the locals and we broke off and headed home. On the way back to the hotel I wondered what Lech was doing, it was extremely disappointing for me that he didn’t join us that evening.